….the main gravitas of the exhibition rests on the work Everything changes and Nothing Changes. 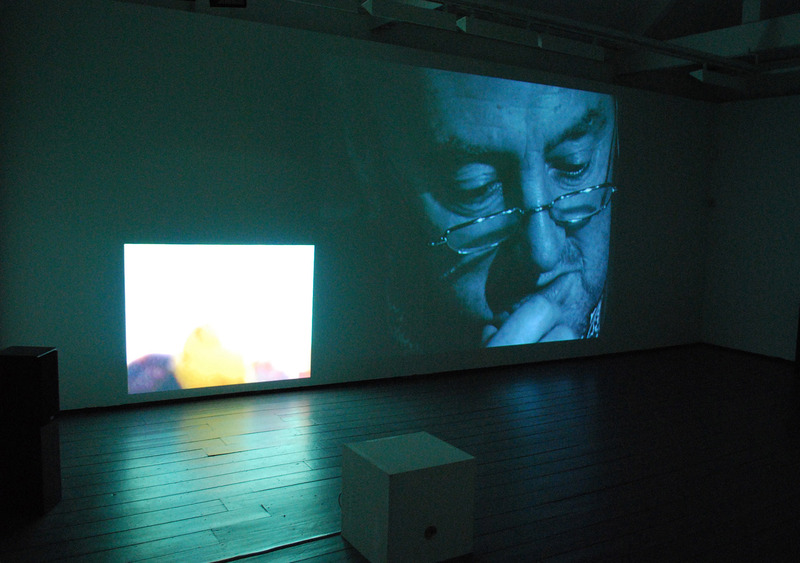 This dual-video installation consists of a small projection of bingo balls dancing colourfully juxtaposed with the larger, and more sombre, monochrome projection of a character acted by Jon Kenny (developed collaboratively by McLoughlin, Kenny and writer Mike Finn). The character reminisces on some of the changes he witnessed in the city, such as when the Limerick City Gallery was the Carnegie Free Library and, because it was free, was a place of social exchange. However, as the script moves it becomes more evident that we are listening to the nostalgic ramblings of a man who only has his memories left. The sense of melancholy and loneliness is enhanced by the foreboding music, while the projection of bingo balls take on a resonance of solitude only touched on in Hurling alone. Hans Bertens maintains that with postmodernism came the ‘aestheticization’ of quotidian activities and leisure, and their subsequent construction as experiences.1 The pluralist postmodern era blurs the boundaries between high art and mass culture, creating an arena for art that is based on social activity. However, McLoughlin goes further than merely highlighting the isolation and displacement that comes with increasing immigration, he presents strategies to effectively counter this problematic issue. In an effort to confront the isolated condition of the individual in contemporary society, the artist unites communities through social engagement, in what can be seen as an emphasis on the collective experience.